A brief intro: So this 4-part essay that I'm publishing over the span of June was written for a call for essays that focused on love and literature. Alas, it wasn't accepted but that just meant it found a home here. I wrote it months ago but chose June to published it because, well, according to the Audio Publishers Association, June Is Audiobook month! I did a similar series a few years ago on audiobooks during June and you can find that under #ListenLit. This is clearly not the first (nor the last time) that I'll talk about audiobooks, but I hope you appreciate the angle this time around. The school year quickly approached, and I would soon face the challenges of middle school and all that the 6th grade had to offer. But I hadn’t leaped through the final hoop into middle school by August: summer reading. I remember none of the other books on the list, but one title, I'll never forget. This blonde-haired meatball of a 6th grade deeply invested in Nintendo, Star Wars, G. I. Joes, horror films, Thundercats, The Hobbit (the cartoon; not the book, mind you), and comic books, looked at the list and one book drew my gaze. It all but formed a golden haloed and shouted with an angelic choir: The Hitchhiker's Guide to the Galaxy by Douglas Adams. I mean, just the title along was seductive with all that it suggested. Hitchhikers in the 1990s were the thing of horror films, either as the victims or the killers. Was this about how to survive in the galaxy or how to destroy it? 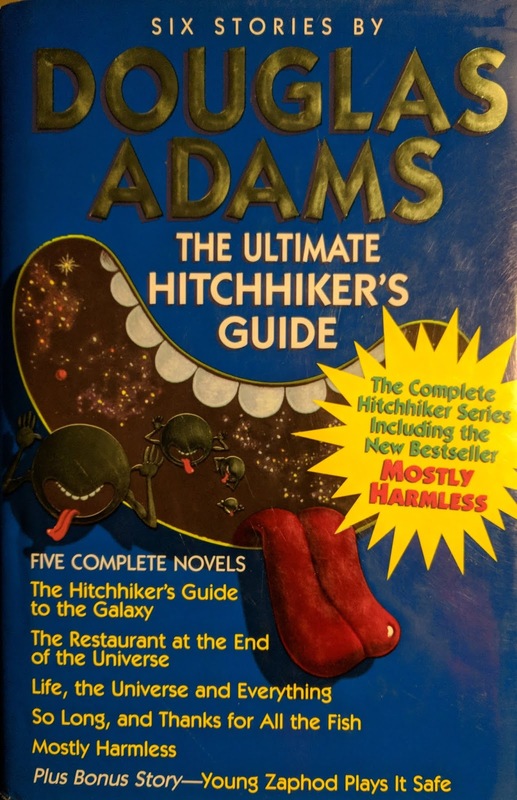 By the 1990s, hitchhikers were as foreign as aliens; which, of course, invoked the second half: "galaxy." Could this book take me to places like the Mos Eisley Cantina, Dagobah, or Cloud City--could this book take me to CLOUD CITY!?!?! And guide? Would this teach me how to avoid Galactus, make friends with the Shi’ar, or figure out if the alien in front of me was a Skrull? The promise of such a tour had me thinking about places long ago and far far away. I wanted--no, I needed a tour of the galaxy because honestly, I was largely checked out of life on this "mostly harmless" planet by 6th grade. I was in in the midst of what I have come to understand as a 7-year depression that started around 10. I was a few years into my suicide ideation phase so even if I were to end up in the vacuum of space, I was totally down with being on Team #AnywhereButEarth. Obviously, the people who made the summer reading list (who are those people by the way?) selected this one just for me. I was ready to pack my towel and take off to anywhere; by all means, let’s get this Earth out of the way for a bypass, I certainly had no use of it. When I found the book at the library, I don't even recall if I read the dust jacket at that point. The cover promised a strange and weird adventure with a green circle that had a mouth and arms but no eyes and it hung among the stars; that's all I can remember from our first encounter. I checked the book out and proceeded to read it. Correction: I tried to read it. Over the next few weeks, I read the opening 20 pages some 20 times. Each time, it seemed stupider than the last. In many ways, it reminds me of my struggles later on with reading Foucault. I regularly try to read work by Foucault, but the density and sense of it is so tiring that after 30-40 pages, I need to take a break from it. I come back and find I need to start at the beginning. Adams challenged my middle-school brain in the same way, apparently. This was my experience with Hitchhiker’s Guide. I read the side jacket and that did not help me. What’s with this guy Arthur and building some streets? Who would name someone Ford and what was so perfect about him? (Note: I’m not sure if this is a result of my dyslexia or if it was changed in the US version, but I always thought his name was Ford Perfect, not Prefect). And what the hell was a Vogon or a Beeblebrox for that matter? It was baffling and frustrating and represented so much of my (at the time) dubious view of reading (anything but comics). In truth, I have no clue how I ended up getting into 6th grade. Maybe I took one of the other unforgettable books or maybe I fudged my way through an abysmal book report on Hitchhiker’s Guide; I just know I did not finish that book. I couldn’t. It made absolutely no sense and I had TV shows to watch, video games to beat, and G. I Joes to play with. 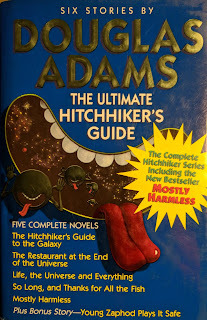 Thus, my first encounter with Hitchhiker’s Guide to the Galaxy left me completely uninterested in it and thinking it was something inane (which, of course, it was). In years to come, I would be told that this is the book I need to read and a few more times, I would try to tackle it. I’d read for those first few chapters and abandon the book for other books. It just didn’t make sense and I was clueless as to why people thought I would like it.